Keeping goats in the backyard is something that more and more people are thinking about doing. Given the current state of the economy, it is wise to consider the possibility of keeping and using goats as a food source – even though they only produce a limited amount. Milk from goats is a lot healthier for humans than cow’s milk and there are many other advantages. Goats need far less room than other dairy animals plus they are smaller and lighter so they are easier to handle. Cows need approximately 1 acre of grass to maintain them, goats need far less than this amount. This makes goats the perfect animal to keep in your backyard if you don’t have a lot of space but still want to keep a dairy animal. They’re also a fairly quiet animal, as opposed to other backyard farm animals like roosters. They are not likely to be a nuisance to those around you, unless they escape of course! Unfortunately, goats are notorious escape artists so you need secure fencing and a shelter to keep them in. Fencing around your garden needs to be strong. Consider using a portable stock pen to keep your goat within its designated area. Portable stock pens are easy to take apart and reassemble, should you ever have to move them. You could also use woven wire fencing to keep your goat safely in your backyard – wire fencing with squares no bigger than 4 inches is recommended. You don’t just have to worry about the goats getting out of the enclosure, you also have to worry about predators getting in. If possible, use electric fencing for additional security. If you plan on housing pygmy goats in your backyard, an igloo style dog house or three-sided shelter will be sufficient enough to keep your goats safe during bad weather. 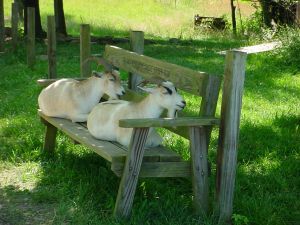 Pygmy goats prefer to sleep up off the ground so providing a raised platform within your shelter is ideal for them.